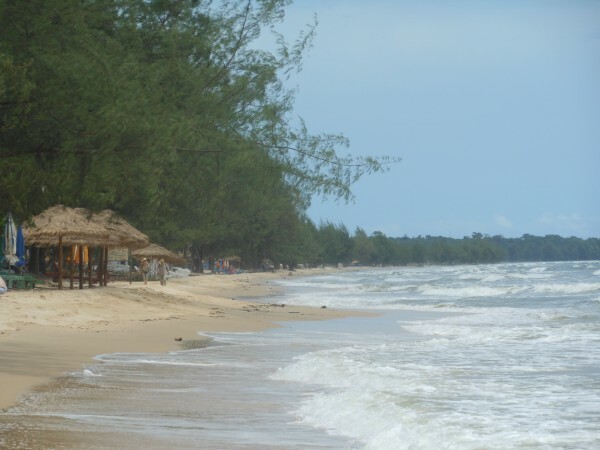 Sihanoukville, located 230 km, or a 3-4 hour bus ride, from Phnom Penh is Cambodia's most well-known beach location. Streets are lined with inexpensive guest houses, hostels, restaurants, movie houses, and luxury resorts. 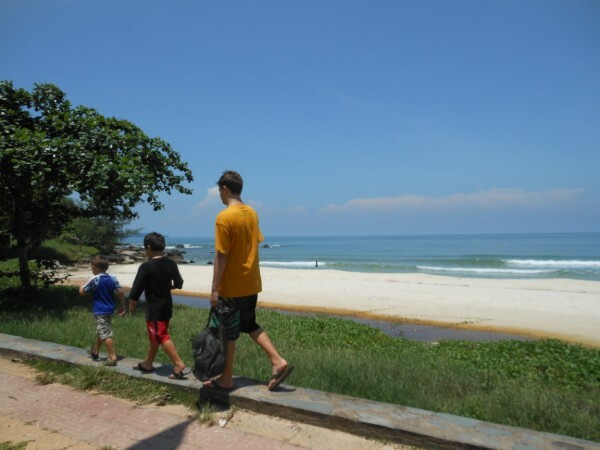 The town is set back away from the beaches but is still a short 10-minute tuk tuk ride away. There you can find markets (such as the local's traditional Phsar leu Market) and all the shopping you could need. 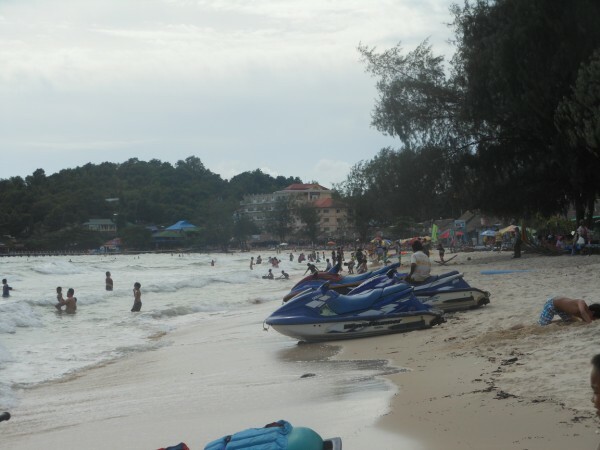 Of course the real draw to the area are the beaches, and Sihanoukville has many! These are the two most popular beaches and where you will find the majority of amenities. Great restaurants, lots of hotels, and a wild nightlife. The beaches themselves are, to be honest, not very nice to look at but the draw here is the accessibility of everything from vendors selling just about everything to jetskis, kayaks, and inflatables to fireworks at night. The beaches are connected with Ochheuteal being busier and the scene of most of the night action. Serendipity is on the far end and much quieter while still retaining the amenities and a beautiful sea view. 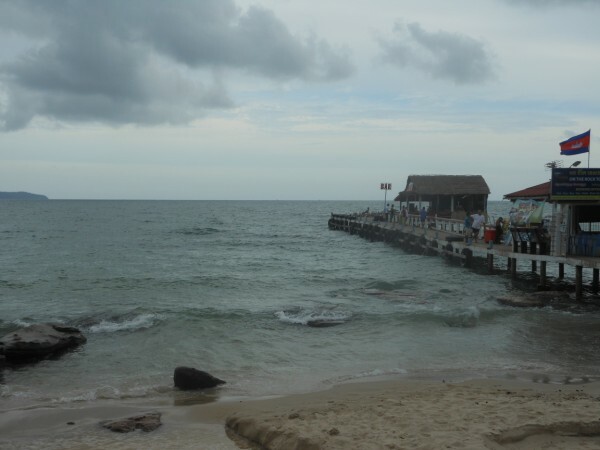 There is also a nice pier that can be fished off of and a bar to grab some drinks while you wait for your catch. The restaurants lay out padded sun lounges and comfy bucket style chairs so it can be hard to leave once you settle in for a meal. The vendors here are plentiful and can be quite pushy. We left the beach many days frustrated at the lack of peace. Victory beach became one of our favorites. It is situated on the far end near to the ports. Victory is super clean and drew us in with the soft sand and bent palms lining the shore. There are some vendors, but not so many that we were overwhelmed like on Serendipity beach. Here you will also find a pier, as well as a water buffalo statue in the water that the kids loved. 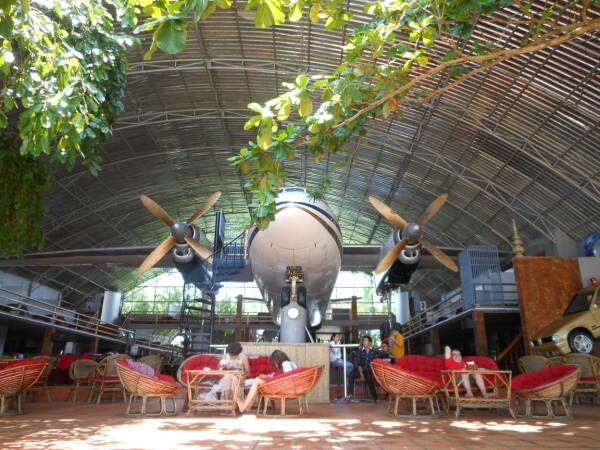 Right on the beach is an interesting restaurant made out of an airplane. Inside you can tour the plane, enjoy billiards or ping pong, and eat and drink from a large selection. In the evening, this place turns into a nightclub and I can only imagine that it is a wonderful evening out full of dancing, drinking, and fun! 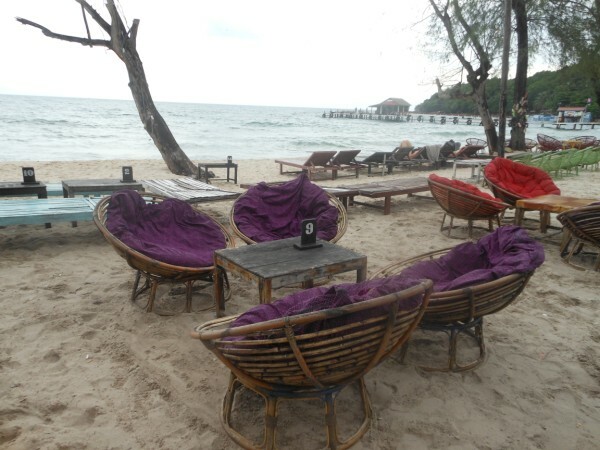 Further down are some small beach shacks offering Khmer food, drinks, and fruit shakes. Be sure to stick around for the sunset, the angle of Victory beach offers the best sunset views! By far the most remote of all the beaches, and a good 15-20 minutes by moto out to Otres, this is also the most beautiful of the beaches. Otres is by far the most peaceful and laid back beach in our opinion. There are few vendors, small restaurants set up on the beach serving food and drinks, and a beautiful yet calm surf to play in. You can also set out to explore some of the remote islands nearby that offer calm swimming and snorkeling for a fraction of the cost as setting out from Serendipity beach. If you are looking for uninterrupted relaxation and seclusion from the crowds, then Otres is the beach for you. If adventure sports is your thing, this is also the beach for you. In the central area there are the options of wind surfing, kayaking, diving, and sailing. But be advised that there are fewer services and getting in and out can be difficult in the evening. If you go by tuk tuk be sure he sticks around for the return journey! Sokha is a small beach but offers beautiful views. 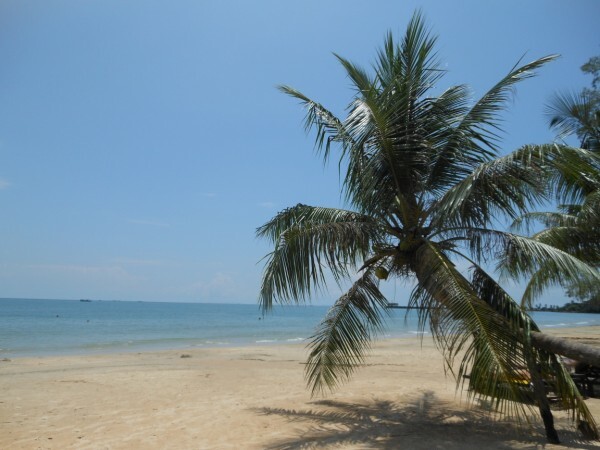 A clean and soft, white sandy area is unobstructed by vendors and can offer a nice respite from Ochheuteal beach, yet is an easy 5 minutes away. There are a few restaurants but not the variety you will find on the other beaches. We enjoyed a couple hours here playing on the dragon sculptures that seem to rise right out of the sand itself! Independence beach was our least favorite. It is undeveloped yet it is not even visually pleasing at the moment. 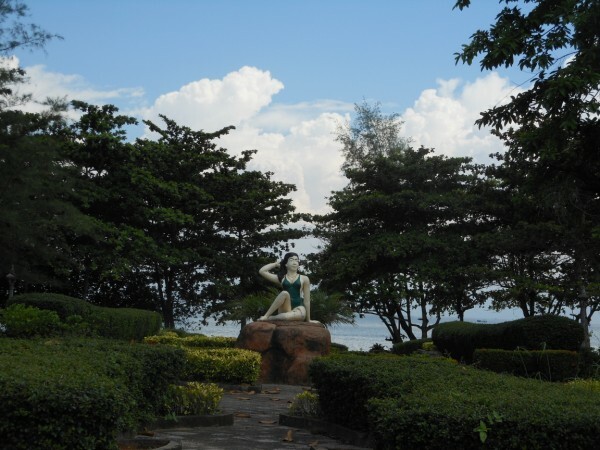 There is a beautiful park area on the beach with gardens and sculptures, but it has been left somewhat untended and is over gown. The beach itself is littered and all the beach shacks seem to be shut down. At the far ends are some high end resorts but, that not being our scene, we didn't investigate. No services and a dirty beach equals very little time spent but you can be your own judge. On the way out to the beach is an area full of monkeys. They sit on the road waiting to be fed, but be careful, a monkey bite will not be a pleasant part of the trip! My advice is to try and get out to all the beaches at least once. They are all quite near each other and can be explored in a single day. Most guesthouses have motos for rent for $5 per day, they will offer the most flexibility. If motos is not your thing you can also hire a tuk tuk for the day for around $15 to drive you all around. Gas is readily available all over so running out is not much of a worry! A final farewell to the beautiful Cambodian beaches! Tips for surviving the Cambodia beach experience: For dealing with the street vendors it is best to show NO interest at all, don't make eye contact, just simply say 'No thank you' and walk away. The minute you show any interest or answer their questions, they will not leave you alone. If you have kids they will target them and start grabbing and cuddling them. For a short trip maybe this will be cute but after 9 months in Asia I assure you my kids have had it! As for the younger children, begging for food or selling you bracelets, don't do it! It is believed that supporting these children by buying their trinkets supports not going to school. Also oftentimes they are out there working for some adult who may abuse them or take whatever you give to them. If you feel really drawn to help buy some food and give them that. It is not easy to ignore them, but it's worse to support this abuse. Said from someone who often doles out more than I am advising here:) So do what feels right at the moment! There are many wonderful organizations near the beaches that showcase art (Starfish foundation), or open restaurants (Sandan Restaurant) where they rescue street kids, teach them a skill, and give them employment.It's better to support the organizations that really help them on a long term basis. Follow our tips and adventures on Facebook! These are some really great beach spots to visit.